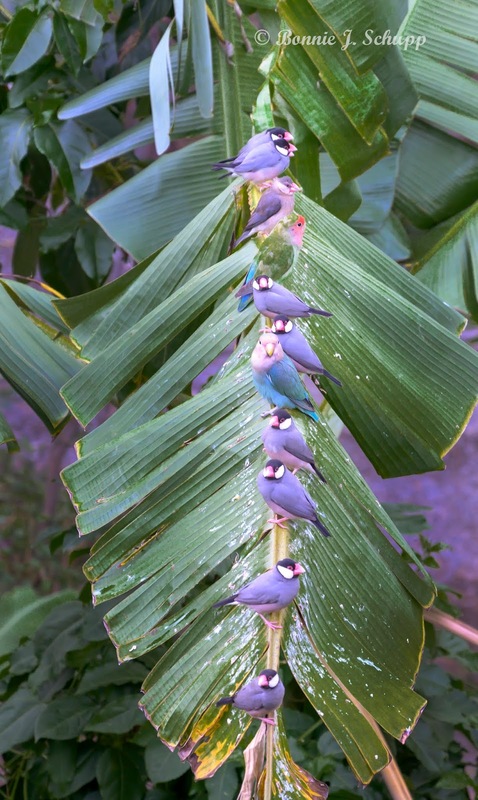 Nature's peep show at Kalalau Overlook. Reluctantly we bid farewell to Maui just after noon on a sunny Thursday, and by 1 p.m. we are stepping out into the sunshine of Kauai -- the last destination of our three-island adventure. Lihu'e airport sits along the island's eastern coast just off the main highway, and about six miles south of our lodging... the longest at five nights, and most expensive. Blame high season in the dead of winter for shelling out $1,478.49. Reluctantly, though, we also admit that luxury is kind of nice. The Kauai Shores Hotel looks at first glance like an average but large motel, with its multilevel buildings forming a rectangle around an open space about half the size of a football field that includes a pool and heated whirlpool too large to call a hot tub. In the main building's spacious open-air lobby, the extraordinarily pleasant front desk lady offers welcoming shell necklaces and the card keys to various rooms for inspection; we settle on paying for a plushy slight upgrade, ground level with a teeny patio and a view of bushes along a fence below a unit in the neighboring resort. But what's not to like about a comfortable king bed and cocoanutty soaps, shampoos and lotions. With the patio sliding door open, there is a pleasant breeze and the sound of Pacific waves crashing onto the beach, about 50 yards away. Beach Birds fly near the Lava Lava Club. In the evening, meal and drink prices go up -- but there's live entertainment most nights, usually a Hawaiian singer/guitarist and a hula dancer. Tacky? Maybe. But we're here five nights, and get to unwind at least a little from the more intense explorations of the Big Island and Maui. Kauai is called the "garden island," but February is not the best month for flowers. It is, however, one of 12 months in which rain can be a daily experience. At the mountain heights in the largely unpopulated center of the island, rainfall can total 400 inches in a year. 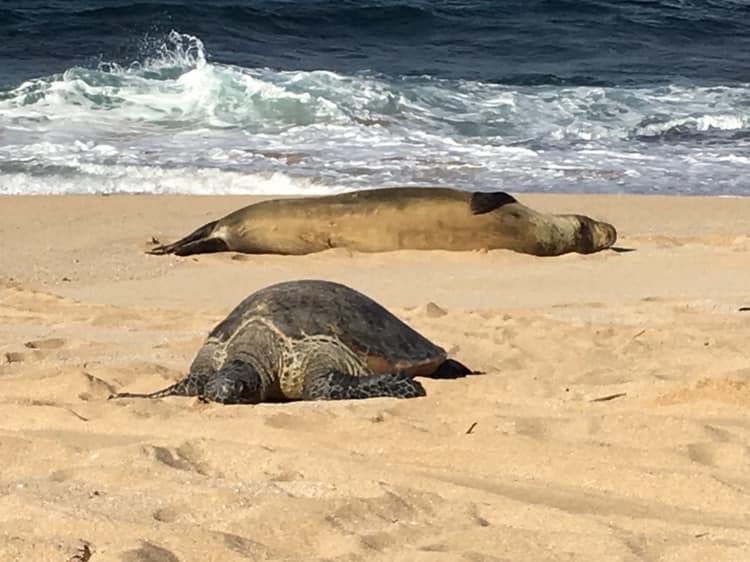 There are basically three directions for travel from our beachfront base -- to the north, south and west -- and they produced three very different experiences. Inouye Lighthouse presides over Kauai's northern coast. 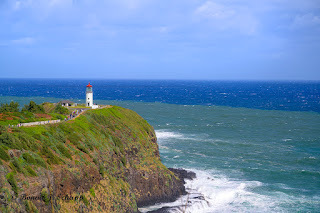 North, and turning westward: The highlight was Kilauea Point National Wildlife Refuge, where the 52-foot Daniel K. Inouye Lighthouse overlooks north shore waves crashing into lava-stone cliffs of a dormant volcano and slopes occupied by an assortment of seabirds. Our annual national parks seniors pass -- purchased on the Big Island after we forgot to pack our lifetime passes -- came in handy, saving the $10 admission price. And since the pass covers a party of four, we invited an elderly couple from Minnesota to be our party guests... at least in passing the entrance gate. The lighthouse was built in 1913, its construction materials brought to the site by ships and unloaded by crane. I'd guess that these days, materials would be flown in by helicopter and, despite that convenience and modern technology, construction would take at least twice as long. Further west along the coastal highway is Princeville, which sounds nice and seems to have a great coastal location on the map. If you like expensive shopping and a golf course resort environment, this is right up your fairway. But not ours. We drove along a few of its streets around the golf course, and got back on the highway. But we didn't get as far as we had hoped. Maybe we should have done more homework. The highway ended after the little, artsy town of Hanalei -- closed to through traffic because of a landslide last spring, a local told us. Judging by the dotted notation on the AAA map, the inaccessible stretch of road is one of the most scenic on Kauai -- beaches, gardens and a coastal wilderness state park. You just can't get there from here without a helicopter or a boat. There is, at least, a McDonald's near the bridge at Hanalei, where I took a quick iPhone picture of a feral chicken strutting near the outdoor tables. 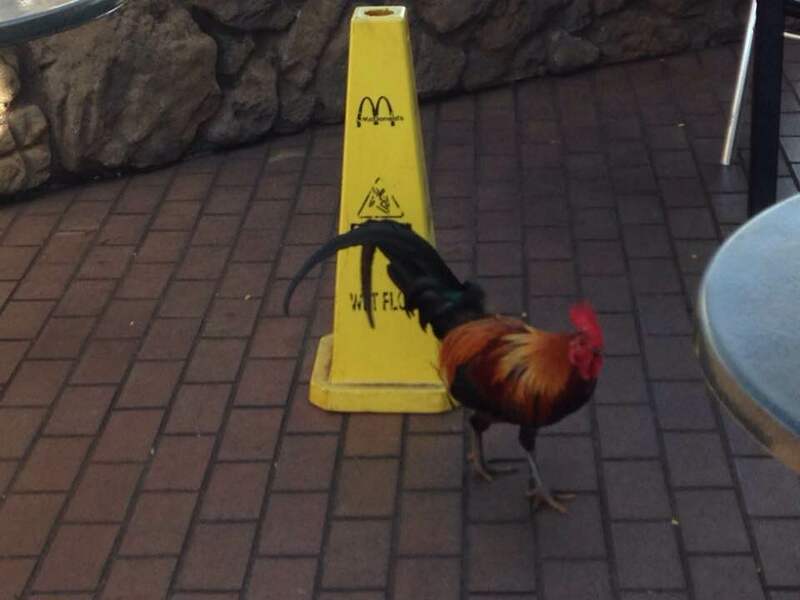 I posted it on Facebook immediately, with the caption "McNuggets on the loose." South and west: The island of Kauai has a grand canyon -- not as enormous as the Grand Canyon in Arizona, but still quite spectacular. 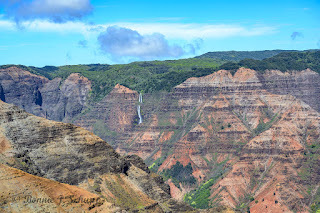 The drive there takes just over an hour along the connected main thoroughfares around the island -- Routes 56 (Kuhio Highway) and 50 (Kaumualii Highway) -- to reach the scenic and slower Route 550 (Waimea Canyon Drive). 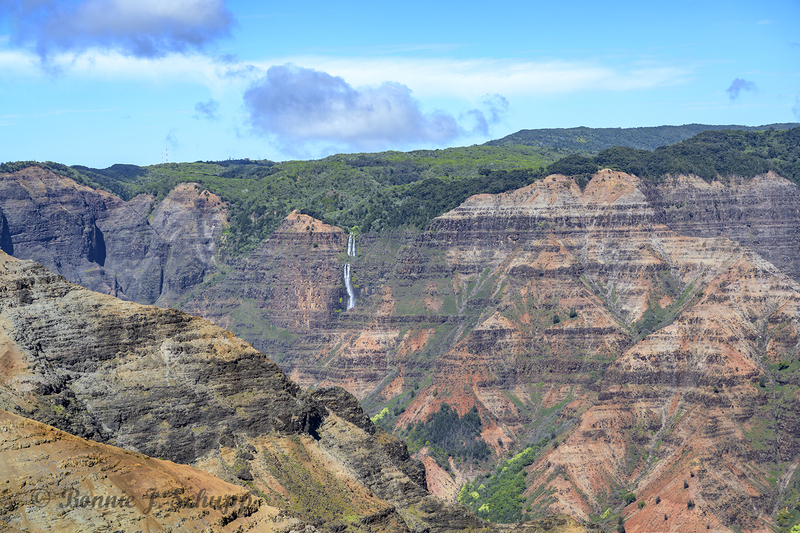 A view of Waimea Canyon, with a distant waterfall. As you might have guessed, the road follows the rim of Waimea Canyon, a gorge that in some sections looks like a smaller Grand Canyon. There are lookout spots along the way, and even an old black lava flow with a gentle stream to explore. And at the very end of the road, beyond the boundary of Waimea Canyon State Park, we reach the best sight of all at Kalalau Lookout. And it is full of clouds blowing in from the ocean. "Ooooh! Ooooh! Quick, quick! There it is, come quick! Ooooh! Ooooh!..." The open gown revealed views of a mountainous cliff, a gorge, and the stunning Kalalau Beach with waves rippling toward the sand of Kauai's northwestern coast. And then more clouds blew in from the Pacific, and the view was gone. Then it was back. Then it was gone. "It's nature's Peep Show," I declared. "Somebody put in another quarter!" It was mesmerizing, magically translucent, the blowing gown between us and the descending sun of late afternoon, with awesome beauty in between and more than a thousand feet below. We didn't have time to explore much of South Kauai, so the next day we had to go back -- passing along the right side of the highway the unusual sight of a roadkill pig. In addition to roaming chickens and goats, Kauai has plenty of feral pigs, and this one was on its side, one hoof in sudden death giving an upraised gesture to swine heaven. Our first stop was the quirky Spouting Horn, named for a hole in a lava rock outcropping that gives voice to crashing waves as a burst of air precedes a burst of water. The spouting horn, so to speak. A little like Yellowstone's Old Faithful, but noisier, not as high and a lot more frequent. And you can see it coming with the roll of the incoming Pacific waves. A little further west, past one of many small state parks along the coast, just past a small airport, we found our way to the salt ponds at Puolo Point. Salt farm pools on Kauai. In case you never noticed, ocean water is salty. 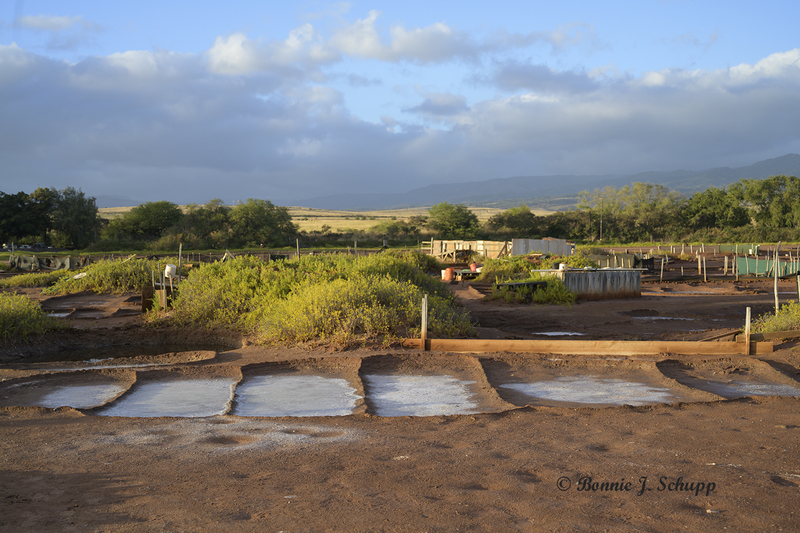 And here at the salt ponds is where generations of Hawaiians have been "farming" salt. The ponds are privately owned by local families -- a field of burial plot-size holes where their owners drill a few feet through beach sand, extract ocean water and then leave it in the pools to evaporate. 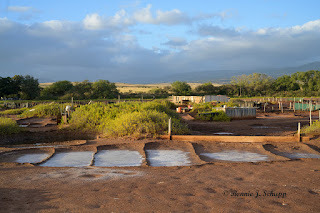 What's left as the water dries away is Hawaiian salt. The process was explained to us by one of the farmers -- an elderly chap from, of all places, Shamokin, Pa. He's sort of a naturalized Hawaiian, having married into one of the salt pond families a few decades ago. His bride sat in their pickup truck while he was checking on their salt pools. Heading back, we pass the pig again -- this time someone with a dark sense of humor (of which I have at times been accused) had attached a helium party balloon to the upraised hoof. I should have turned around and gone back for a picture, but we were in heavier traffic and fighting the clock in hopes of another happy hour feast. So Mr. or Ms. Piggy will just have to live on in memory. We missed happy hour by 20 minutes. We took a Sunday drive in search of waterfalls, heading west from the resort despite a dicey forecast of high winds and occasional downpours. After all, what could go wrong? Lots of rain should fuel lots of waterfalls. It'll be pretty. The first hint of trouble was a detour -- southbound Kuhio Highway backed up for miles, but we found a small inland route in the direction of Wailua Falls and a botanical park. The road was not in the greatest shape, with lots of potholes and fallen tree branches to maneuver around. We reached the parking area for the botanical park, and it was mostly under water and surrounded by mushy and muddy turf. And the rain started coming down in torrents. The only road out, blocked. So we turned back the way we came, only to discover that the only passable road getting in was now blocked by a fallen tree and downed power lines. And there was no way out. Not the best of tourist moments, really. But we were impressed by the speed of the local utility crew, which arrived within about 20 minutes and spent the next hour dealing with power lines and tree limbs. A local resident trying to get out returned home to retrieve his chainsaw, and added some volunteer labor to speed up the work. And then, on the way back to the main highway, we found a viewing spot for a distant waterfall and, toward the island's eastern coast, a rainbow. Rainbow in view toward eastern coast. Our adventure the next day, retracing the main roads southward, was the McBryde national tropical botanical garden, where $30 buys a bus ride into a huge preserve of fauna -- especially trees. 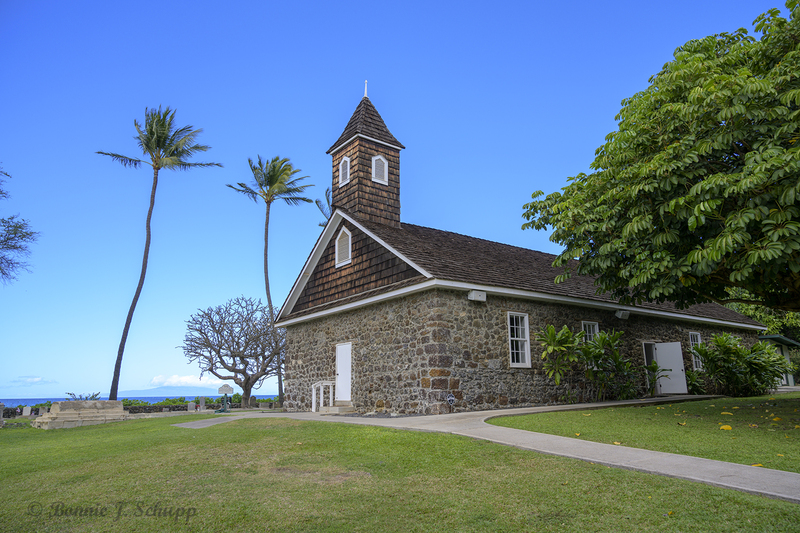 Oddly, we learn, most of the trees and plants in Hawaii are non-native, but perhaps not so surprising as just about anything will take root on the islands. 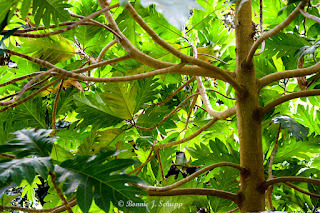 Breadfruit tree planted at McBryde in honor of Michelle Obama. We wandered on foot just over an hour, and as rain began falling caught the bus back to the visitor center. Unfortunately, we did not have time -- and maybe not the weather -- to cough up a few more dollars to check out the other tour at the adjoining property, Allerton Garden, which includes some huge specimens the brochure describes as "Jurassic Park trees," and the beachfront mansion of the Chicago millionaire bachelor who purchased 83 acres of the valley 80 years ago. We were leaving Kauai late Tuesday afternoon, flying back to the Big Island for two more nights and then going home. With a hotel checkout at noon, we had enough time for one more adventure -- and, at least for me, some free coffee. Back to the southern coast, perhaps half an hour from the airport, is the headquarters and visitor center of Kauai Coffee, which offers both guided and self-guided tours and tasting of more than a dozen variations ... dark, mild, flavored. We had time for the self-guided stroll through a garden of experimental coffee trees, and past displays showing what happens after beans are harvested. Never would have guessed that one tree, once a year, produces just about a pound of coffee beans. 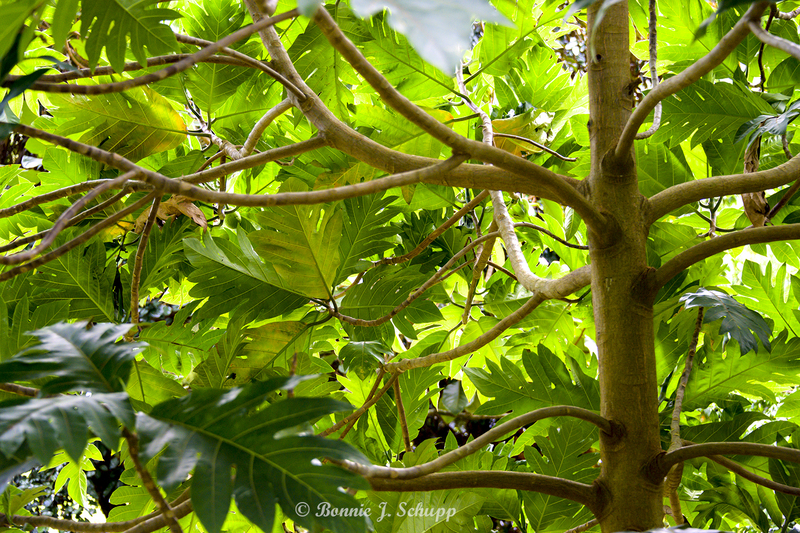 Fortunately, Kauai Coffee has a lot of trees in a coffee forest that stretches for miles. I sampled several varieties (Bonnie, alas, is not a coffee drinker but at least likes the smell), a couple of which are carried back home at the local Safeway. Hard to believe the regular price in Pasadena, Maryland, for a 10-ounce bag, all the way from Kauai, is just $8.99. (Confession from Mr. Cheap: I bought one at Safeway that was on sale for $6.99, and even had a coupon attached that knocked off another dollar.) 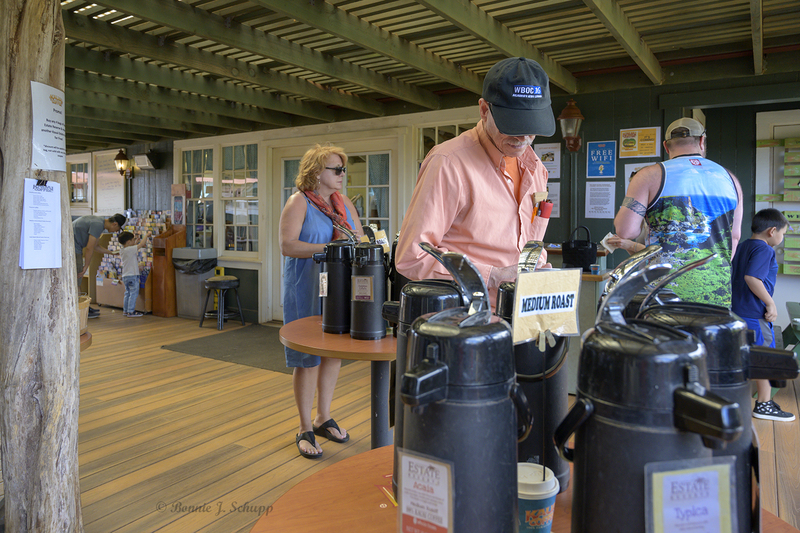 Prices vary for the various coffees at the visitor center gift shop, but the basic commercial blends there cost about $11.99 for a 10-ounce bag. By late afternoon, bags checked, we were boarding our final Hawaiian Air flight, heading back to the Big Island. Our lodging this time was our only Air BnB of the trip, in the back bedroom of a large and lovely home of a most hospitable gay couple. One of our hosts offered to help tote our baggage up the steps to our porch, which offered a distant view of the ocean beyond a long green hillside dotted with other homes. We also took a stroll around the property, admiring a variety of fruit trees. As we learned on the trip, just about anything will grow in this environment... and the garden included banana, orange, lime, avacado, papaya and guava trees. Our hosts offered a jar of guava preserves to take home. A couple of tourists at the Waipio overlook. 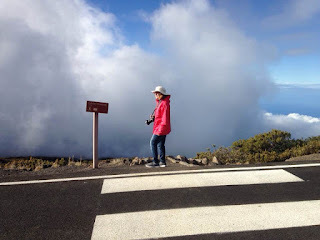 We had time on the Big Island for one more big adventure, driving to the northernmost section at the urging of our Baltimore friend Margie who described the scenery there as the most beautiful she had ever experienced. 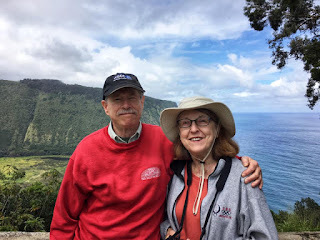 It meant re-tracing some of the drive from our first explorations of the island to reach the overlooks of the Waipio and Pololu valleys and coast -- vantage points separated by a drive of more than an hour from one cliff to the other. It was incredibly beautiful. But the best? That's hard to say after two weeks of Hawaii. The three-flight journey home was to begin about noon that Thursday from KOA. Emphasis on the word was. Always check for email messages before heading to the airport. We didn't. We dropped off the rental car a little after 10 a.m. That was mistake number two. The Alaska Airlines plane that was to begin our 17-hour journey -- to Sacramento, with transfers to San Diego and then Baltimore -- was still on the ground in California because of weather delays. The only alternative in getting home was a cockamamie route flying at 4 p.m. to Portland, Oregon, with a five-hour layover for a dawn flight to Seattle, and another hour on the ground before the flight home to BWI. But even that didn't quite work out as scheduled. So after six hours on the ground at the outdoor KOA air terminal, we tried to sleep in a nearly deserted airport in Oregon -- despite public address announcements echoing through the corridors every 30 minutes from the city police chief urging us to report unattended baggage or suspicious behavior. Every concession shop was closed for the night, but I managed to read the various newspapers left in piles outside the locked shop near our boarding gate. I was hungry and thought about stealing a $1.50 banana from the bowl at the nearby closed Starbucks stand, but that would be suspicious behavior -- not that there was anyone who would see it. Just the security cameras above the counter doubtless beaming the scenes from the empty airport to the very desk of that annoying police chief. The flight out of Portland, despite being one of the first of the day, was an hour late. We had to run to the gate in Seattle, where our last flight of the journey had its last call for boarding. Our luggage could not run as fast. All credit to Alaska Airlines, however -- 24 hours after our arrival at the KOA terminal on the Big Island, we were on the tarmac at BWI. And when our stuffed suitcases did not emerge on the carousel, an airline employee tapped our receipt numbers into his electronic device and said they were in Los Angeles. 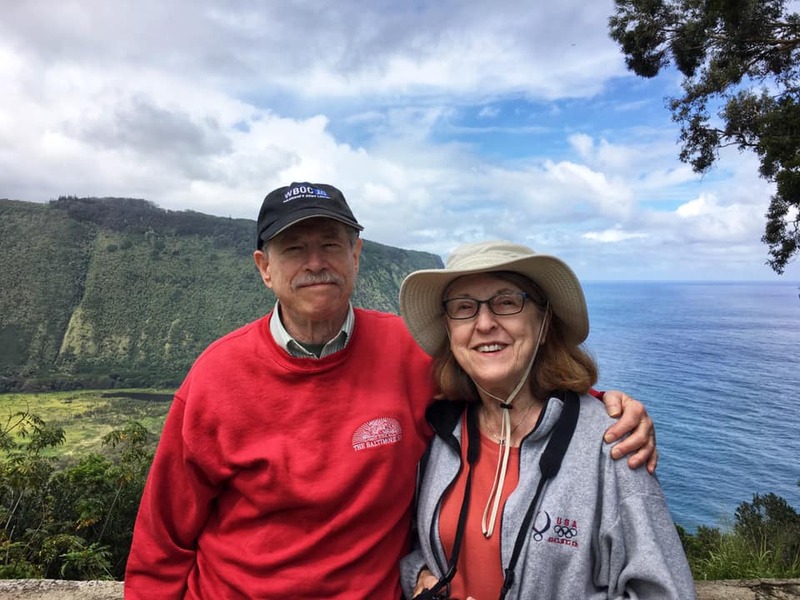 He bestowed upon us a credit of $75 for our next Alaska Airlines adventure, and the suitcases were delivered to our doorstep a day later -- intact, and the contents including jars of guava jam and passion fruit jelly unbroken.